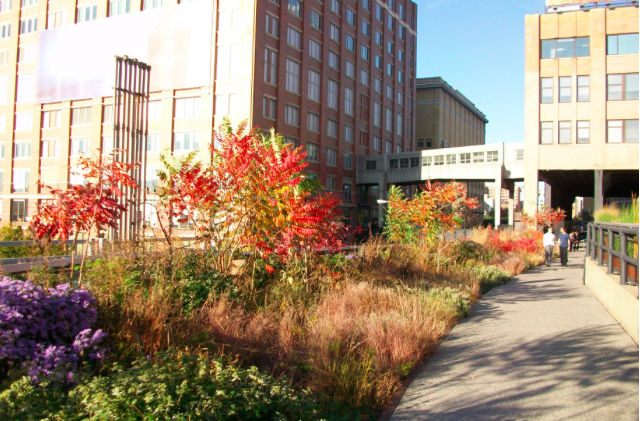 April is a good month for all things Earth, parks, trees, and landscape architecture. The first Earth Day was celebrated on April 22, 1970 and is celebrated annually on that date. Have you noticed that we know celebrate Earth Week and recently I have seen announcement for Earth Month celebrations. Another nature celebration observed in April is National Arbor Day. The day of observation in the U.S. is the last Friday of April. 10 Parks that Changed America tells the story of 10 visionaries who took open canvases of God-forsaken land, and transformed them into serene spaces that offer city dwellers a respite from the hustle and bustle of urban life. From the elegant squares of Savannah, Georgia, to a park built over a freeway in Seattle, to the more recent High Line in New York, each story introduces the heroes who brought these parks to life, and the villains who preferred to exploit the land for private enterprise. Discover the evolution of our nation’s city parks, and learn the history of landscape architecture – an American-born art in which human beings try their best to mimic nature. The summary names three of the parks that will be featured -- Savannah's squares, Seattle's Freeway Park, and NYC's High Line. You can probably guess that Central Park is also on the list. Another Seattle park made the list, too -- Gas Works Park by renowned landscape architect Richard Haag. You can watch a clip of the Gas Works Park episode. The other parks are Philadelphia's Fairmount Park, Boston's Mt. Auburn Cemetery, Chicago’s Neighborhood Parks, San Antonio's River Walk, and Memphis' Overton Park. The parks were selected by a committee including the documentary's producers and "expert advisors" Thaisa Way, Walter Hood, and Peter Harnik. One glaring omission? The National Mall, reports Jared Green for Huffington Post. ASLA executive vice president and CEO Nancy Somerville told Green that she would have liked to see the National Mall included on the list because it represents the "'power of places to bring people together. It was hugely influential in setting the public park or plaza as the place where people get together to express themselves. It’s the epitome of that.'" What other parks do you think changed America? Complete details about the 10 Parks That Changed America episodes are available here. Don't forget to mark your calendar for the April 12th debut. 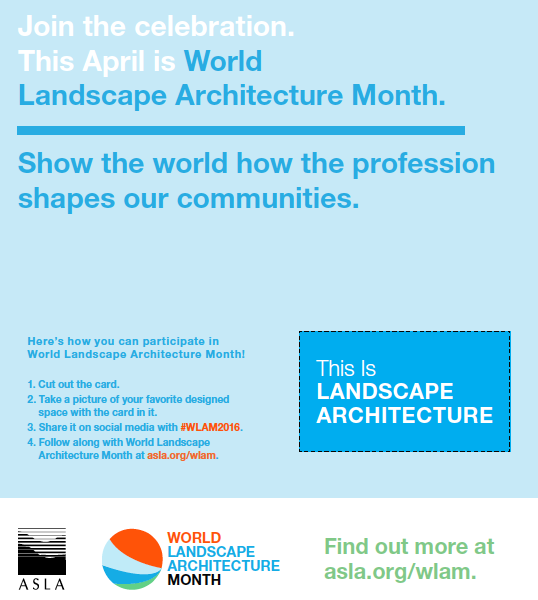 *World Landscape Architecture Month was originally known as National Landscape Architecture Month. P.S. I can't believe I forgot to include National Citizen Science Day which runs from April 16 to May 21. Find an event or list one. April is also National Garden Month. What will you grow?